ALKHOBAR, 18 July 2006 — Oil, Iran and air bases, seem to be issues of recent times. Not indeed. It was some 55 years back that these issues were very much in play and a recently declassified document indicates that these were the reasons behind the assassination of Liaquat Ali Khan, Pakistan’s first prime minister on Oct. 16, 1951. Like a number of other high-profile killings, the assassination of Liaquat Ali Khan, has also remained a mystery. Conspiracy theories abound, yet are difficult to substantiate. A recent declassified document from the US State Department brings to light some interesting facts. According to the document, a telegram was sent by the American Embassy in New Delhi on Oct. 30, 1951. 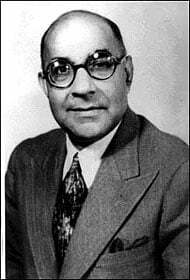 “Is Liaquat Ali Khan’s assassination a result of a deep-laid American conspiracy?” The telegram from the US Embassy in New Delhi carried the summary of an article published in the Urdu daily of Bhopal, “Nadeem” on Oct. 24, 1951, charging the US with the responsibility of Khan’s death. The declassified document reveals that the day before assassination, the secretary to the American ambassador in Karachi absent-mindedly jotted down “holiday” for Oct. 19 in a table diary and then immediately struck it off. Following the secretary’s departure, Mohammad Hussain, a Pakistani employee at the American Embassy in Karachi asked the secretary’s British clerk about the holiday. The clerk described it as a possible slip. “Mistake meaningful,” however, because “the secretary knew the embassy would be closed (on) Oct. 17 (sic) although no American or Pakistani holiday was scheduled then to fall that day. The story in Nadeem then points to another fact, as given in the declassified document. The American ambassador (in Karachi) offered condolences to Liaquat’s wife (Raana Liaquat Ali Khan) on the phone, some three and a half minutes before even the Governor General of Pakistan Khawaja Nazimuddin managed to offer his condolences. This was despite the fact that the governor general was the first to be informed (of the killing) by the Rawalpindi authorities. Indeed with no mobile connection, no live transmissions, even no TV, those were different days and the flow of information was much slower than today. The question that the newspaper article thus tried to raise was how did the American ambassador come to know of the assassination before the governor general of Pakistan found out? The newspaper article, as summarized by the declassified US document, then discusses the possible reason for the disenchantment of the US and the UK governments with the Pakistan prime minister and his government. Liaquat was not ready to toe the US line, the newspaper pointed out and hence the US wanted him eliminated. “While the UK was pressing Pakistan for support on the issue of Iran, the US demanded Pakistan use its influence in Tehran and persuade it to transfer control of its oil fields to the US (oil apparently has remained a major issue with the Americans ever since, especially while Mohammad Mosaddeq was in power in Tehran then). According to the article, Liaquat Ali Khan declined to accede to the request. “The US then threatened to annul the secret pact on Kashmir (between Pakistan and the US). Liaquat replied that Pakistan has annexed half of Kashmir without American support and would be able to take the other half too.” Not only that, Prime Minister Liaquat Ali Khan also demanded that the US vacate air bases in Pakistan. “Liaquat’s demand was a bombshell for Washington. Americans who had been dreaming of conquering Soviet Russia from Pakistan air bases were flabbergasted,” the article emphasized. And hence the plot to kill Liaquat was hatched, says the article. However, “the US wanted a Muslim assassin, so as to obviate international complications. The US could not find a traitor in Pakistan (apparently for the reason that the new country was then brimming with nationalistic pride and hope for future),” the article added. At this the “Pashtoon leaders induced Akbar to take the job and also made arrangements for him to be killed immediately after so as to conceal the conspiracy. The Pakistani currency recovered from the assassin’s body also reveal that others were also involved. Due to already strained relations between Pakistan and Afghanistan no currency exchange was then taking place between the two countries. Hence only the “American Embassy (in Kabul) could have supplied the Pakistani currency notes to the assassin,” the summary argued. The article also mentioned that the cartridges recovered from the body of the assassinated Pakistani premier were US made. The type of bullet used to kill the Pakistani prime minister were in “use by high-ranking American officers”, and were “not usually available in the market”. The rest is for us to deduce. The article then summarized that all these facts prove that the real culprit behind the killing was the US, which had committed similar acts in the Middle East as well. There are many parallels between then and now. And all this could not be just a matter of chance. Oil, assassinations, dollars, Iran, air bases, all these sound familiar even today. Fifty years have passed, yet things may not have really changed.